The HELIX is built on a 5-5-4 pattern, centralizing core buoyancy to raise the position of the hips in relation to the rest of the body. 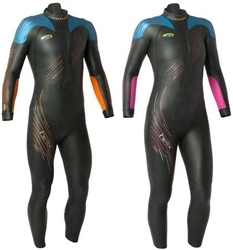 The chest and torso panels utilize super buoyant 5mm Yamamoto Aerodome to keep the hips high and promote an efficient downhill swimming position. Highly flexible 100% nylon ultra-stretch jersey is lighter and features a 35% improvement in elongation compared to the previous jersey making this the most blueseventy suit ever. The redesigned split chest construction naturally and anatomically accentuates the lungs, producing the optimal amount of buoyancy while maximizing stretch during respiration. Ultra light catch panels made with the same hydrophobic textile fabric used in our swimskins. These minimalistic forearm panels increase awareness of arm position in the water, encouraging better technique and more power. Friction free neck design with lower profile and more sighting freedom than any other suit. The new HELIX benefits from extra lift at the back legs from ultra buoyant NBR foam sandwiched between premium Yamamoto rubber and jersey liner. This panel technology allows us to strategically place high buoyancy sections at the back legs, lifting the suit up in the water. The distinct blue panels of the HELIX have been a standout feature since the first model was released in 2006. For 2018 we further advanced this technology by pairing the premium Yamamoto 40 cell blown blue rubber with ultrastretch jersey to provide amazing arm and shoulder mobility. Premium Yamamoto 40 cell arm and arm gussets provide the flexibility and comfort of a second skin with the speed and propulsion of a full suit. 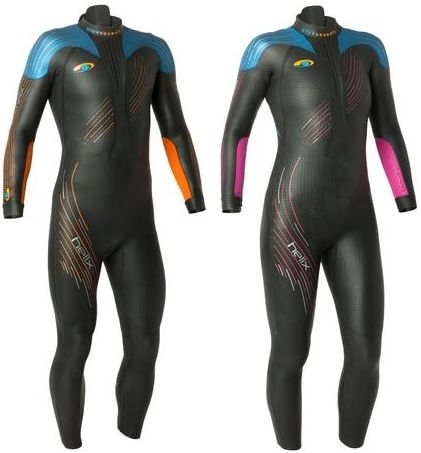 Body mapped, gender specific 3mm Fit Panels contoured for an improved fit on land and excellent rotation in the water. Incredible service. Immediate email response to verify sizing, followed by an email confirming sizing and delivery. Looking forward to visiting the store in person. Very happy with this suit and the help I received over the phone regarding fit. It's fast and feels great in the shoulders!